There’s a beautiful world of mushrooms out there, and each variety possesses their own unique and delicious flavor profile. Some are mild and delicate (oyster), some are woodsy (porcini), others are earthy and bold (portobello and cremini), some even a bit smoky (shiitake) or nutty (morel). Roasting these beauties enhances their flavor and deepens their natural sweetness, imparting a wonderful umami character to dishes. 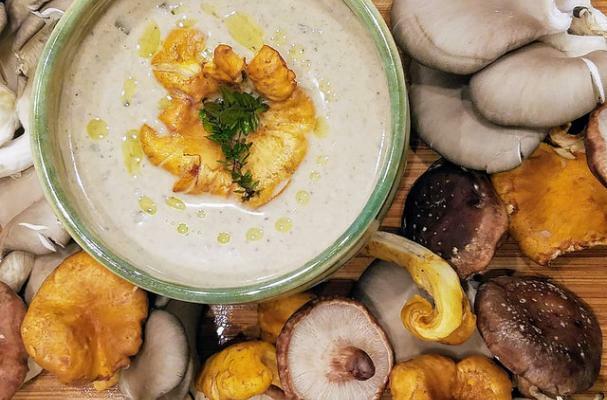 Mushrooms are loaded with essential nutrients, but as their cell walls are indigestible, you must cook them to unlock their full nutritional benefits. Many wild mushroom varieties are cultivated, making them available outside their regular spring-fall seasons. For the recipe below I used a combination of organically farmed chanterelle, oyster, king oyster, and shiitake mushrooms, but use what is available in your market (aim for at least two varieties though). 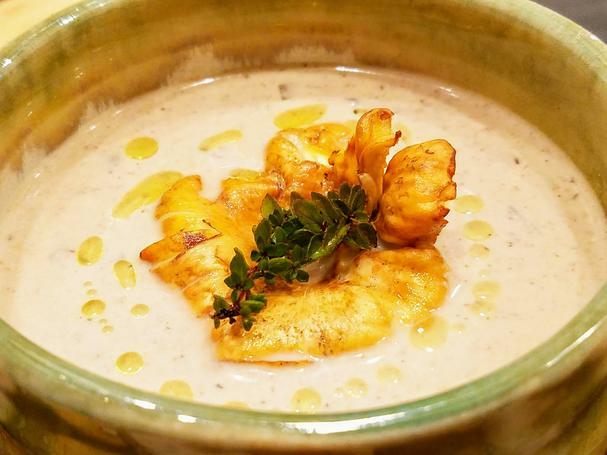 This rich and creamy roasted mushroom soup is easy to make (all you need is a baking sheet, blender, and a pot) and is perfect for any night of the week; it's even elegant enough to serve at a dinner party. Drizzle a bit of decadent truffle oil over each bowlful before serving. Preheat oven to 400°F. Line a large baking sheet with foil or a Silpat mat and top with mushrooms. Generously drizzle mushrooms with olive oil. Season with salt and pepper and toss to coat. Cover the mushrooms with foil and bake for 30 minutes. Uncover and continue roasting about 15 minutes longer. Remove from oven and let the mushrooms cool slightly. Add the mushrooms and any remaining oil from the baking pan to a blender. Puree the mushrooms with 2 cups broth in blender until smooth, then set aside. While mushrooms are roasting prepare the broth. Melt butter in a large pot over medium-high heat. Add the onion and garlic and sauté until the onion is tender, about 7 minutes. Add the sherry and simmer until almost all of liquid evaporates, about 2 minutes. Add 3 cups broth, cream, and thyme and stir in the mushroom puree. Simmer over medium heat until slightly thickened, about 8 minutes. Season soup to taste with salt and pepper.